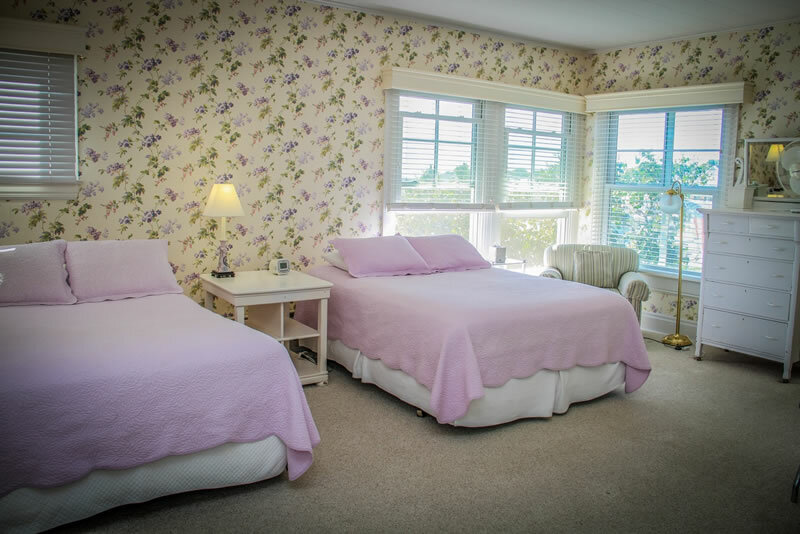 The Mackinac Island Yacht Club facility provides eight rooms for the convenience of its members. 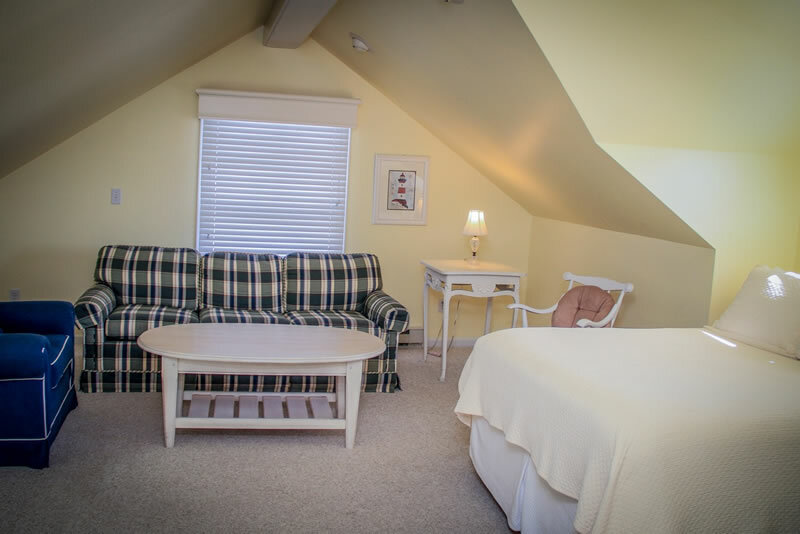 Each of the Mackinac Island Yacht Club rooms has its own bathroom and is equipped with a ceiling fan. Please remember that there are no televisions. Please contact the Yacht Club staff at (906) 847-3363 to reserve a room. For room rates, please view the Members Only section of the website. Enjoy the beautiful waterfront view from Room #1. The pastel décor offers a cool peaceful ambiance for your warm summer visit. Room #1 can accommodate up to five people. There are two queen size beds and sufficient room for a rollaway. For those who are visiting with guests, Room #1 adjoins Room #2. Hide out and watch the boats from this waterfront room. Painted in warm burgundy and finished with the touch of flowers, this room offers the cozy comfort of your own home. 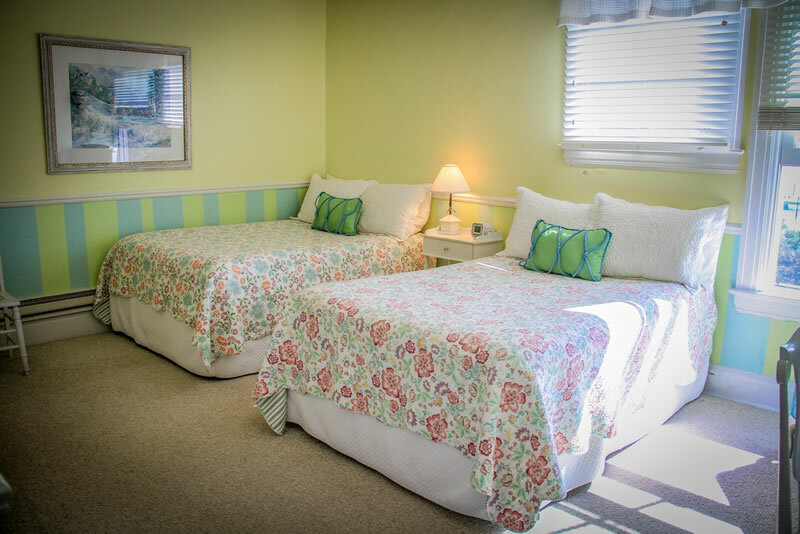 It is furnished with two double beds and adjoins Room #1 if other sleeping arrangements need to be made. It may be raining on the Island, but it’s always light and airy in Room #3. This room brightens any stay at the Club. The three large windows facing the lake offer the best view in the building except for the porch, of course. There are two double beds and room for a rollaway. Get away from the hubbub of the street. Enjoy a quiet visit in this nautical-themed room. Room #4 has a queen size bed which makes this backside room ideal for two. Feel like a kid again! Stay in Room #5 with a friend for a getaway at the Club. 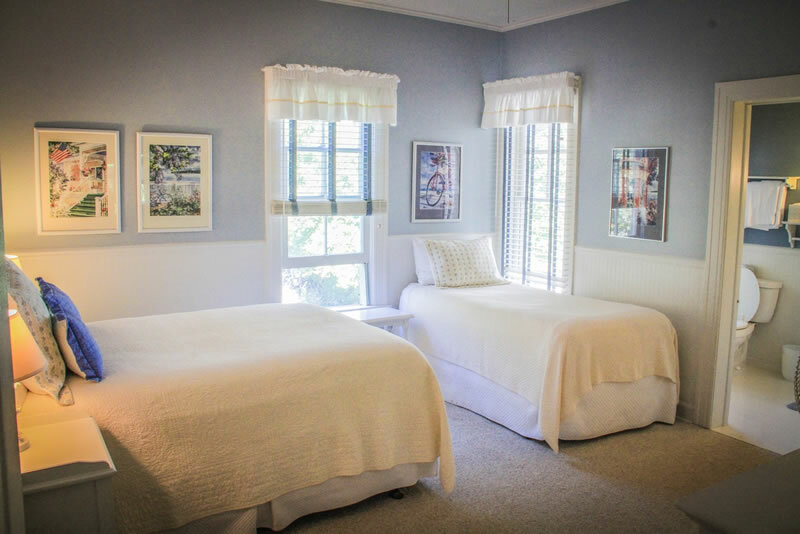 This room, colored in sky blue, features a full and a twin bed and plenty of room for a rollaway. The perfect room for two, Room 6# is furnished with a queen bed and is located on the backside of the house. 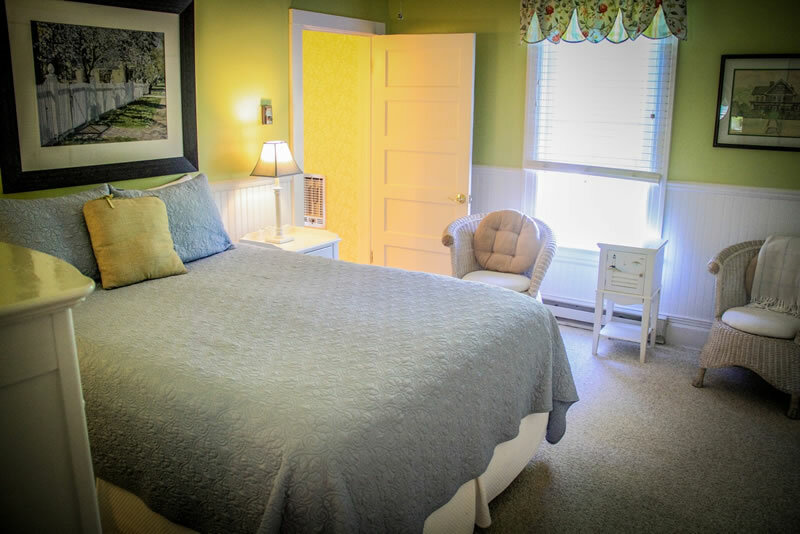 Enjoy a peaceful stay in this quiet room. You don’t need to be the Commodore to stay in Room #7, but you'll feel like the master of the house. 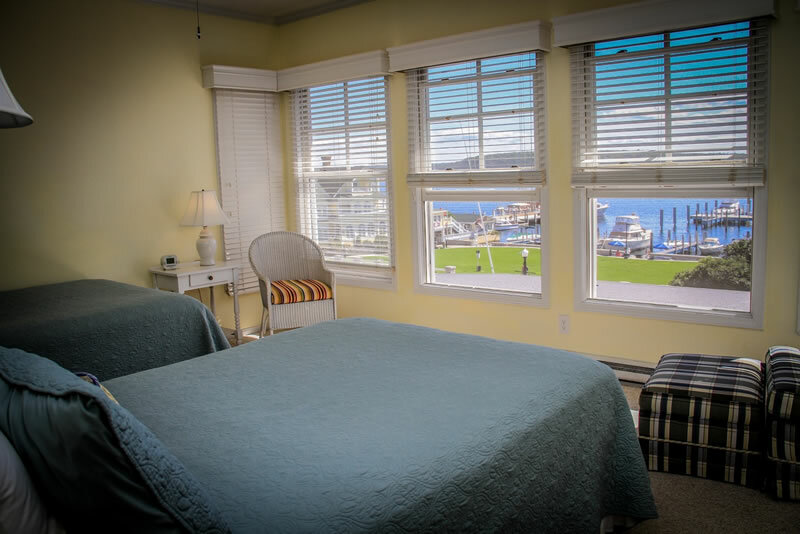 Enjoy a waterfront view from this AIR CONDITIONED suite. The front room is the bedroom with a king size bed. The back room is your own quiet living area. 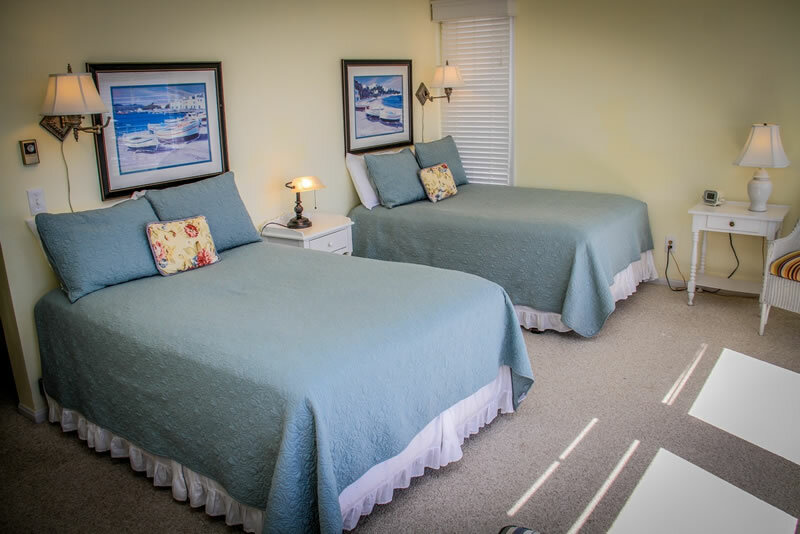 The back room is furnished with a wet bar, twin bed, pull out couch (full), and a comfortable lounge chair. If you decide you want to share this luxury, the Room #7 Suite can accommodate up to five people. 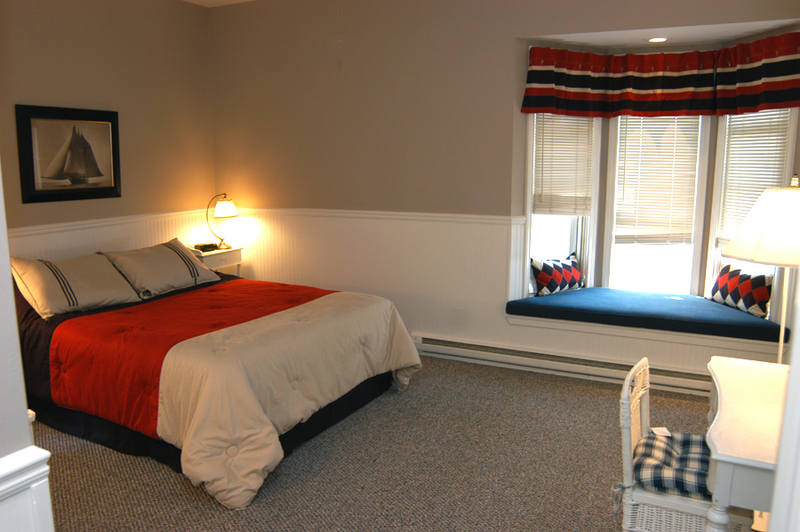 Room #8 is a quiet room with a double bed tucked away at the top of the house. It has a restful view of the woods behind the house and features air conditioning for those hot summer days. 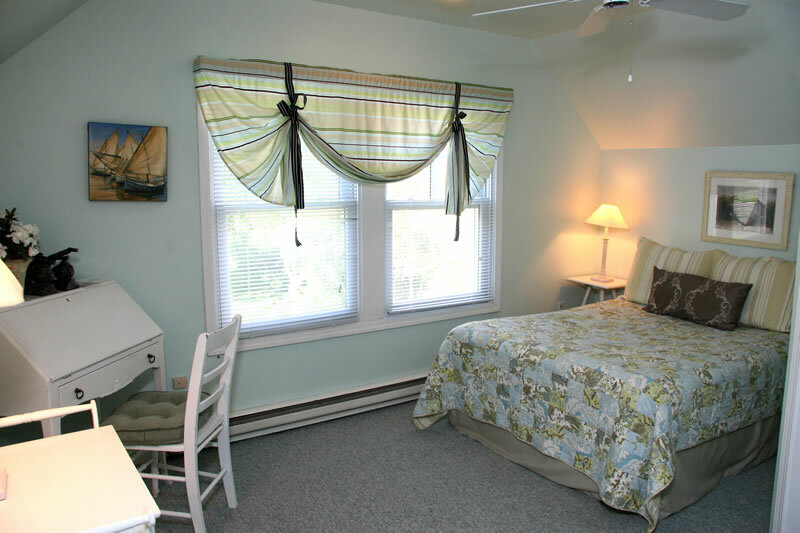 The following are room policies established by the Mackinac Island Yacht Club. For room rates, please view the Members Only section of the website. 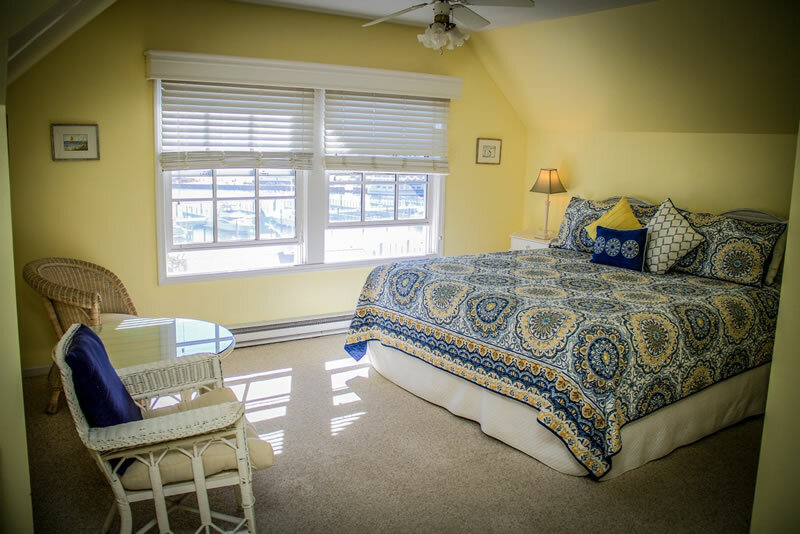 The Club has eight rooms available for rental to members during the summer season. A limited number of cots are available upon request. Not more than four (4) people shall occupy one room and two of the four shall be parents or equally responsible adults. 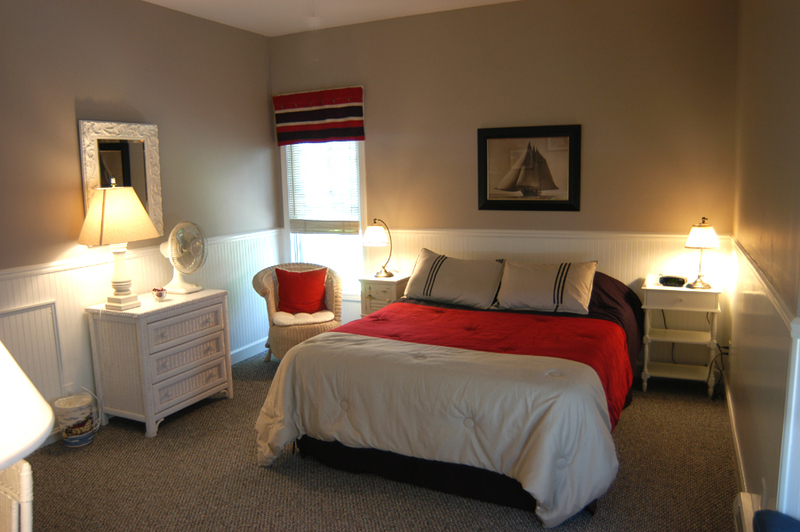 Following are the policies and procedures that apply to rental rooms. Room reservations shall be made only by members and room deposits shall be accepted only from members. Reservations must be accompanied by a deposit, equal to 100% of the room rate, for each night reserved. No reservation will be recorded until the Club has received a check, cash or a Visa or MasterCard authorization. Payment of room charges, plus appropriate taxes, is due at checkout. If the balance of a guest’s bill is not paid at checkout, it shall become the responsibility of the member who reserved the room. In no event should the Club become involved in receivables from non-members. MIYC Rooms Policy adopted by the Executive Committee September 1997 – Starting 1999 Season. June 15 through Labor Day, rooms will be available for members only, on Friday and Saturday night. During the nights of Sunday through Thursday, a member may reserve only one room for their guests, except during the month of July. For the entire month of July, rooms will also be available for members only. Members still need to be present on the island with their clubhouse guests. Before June 15 and after Labor Day, demand for room reservations by the membership decreases dramatically. During these periods, rooms are available without the above restrictions to members and their guests. If 30 days prior to a date a room is available a member’s guest can be accommodated. Any unreserved rooms may be rented for a member or guest. Special arrangements may be made at Manager’s, Commodore’s, and/or Rear Commodore’s discretion. Members must pay in full for rooms at time of reservation. A $25.00 cancellation fee will be charged per room up to 60 days prior to the reservation date. All check-ins are by 6 p.m. unless the clubhouse is notified by telephone on the day of check-in. If members and/or their guests do not check in or call by 6 p.m., their room(s) may be re-rented. Members will get their deposit returned, less a $25.00 service fee per room. No refunds will be given for any cancellations except at the discretion of the Manager, and/or the Commodore, or the Rear Commodore. During the yacht races, rooms will first be offered to member racers and members of the race committee who are members of the MIYC. Reservations for these dates will not be accepted from the general membership until May 15th of the year the race takes place. No rooms will be available to non-members during the yacht races. Yacht race bookings are for a minimum of three nights, generally Sunday through Tuesday. Rates for these three-day periods will be 50% higher per room than regular rates. During these race periods, the MIYC will strictly enforce clubhouse rules regarding use of guestroom facilities by members only. For periods before June 15 and after Labor Day, members wishing to book five or more rooms at one time must book the entire house. NOTE: Except during July a member may reserve adequate rooms for the member and dependent children under the age of 21 with the consent of the Manager and a Commodore. The room rate for family rooms shall be at the member rate.